This year’s Beltane gathering is April 27 – May 4 (Saturday to Saturday). Please read the Call and register, so we know how much food to prepare! Celebrating the rich history of Beltaine, the Church of Nomenus calls to elevate the stories of our respected Radical Faerie elders, as we Root to Bloom. Radical Faerie culture is what we share in common, and the purpose for our gathering and our prayers. We seek to listen and learn from the rich history and experience of our Radical Faerie elders, as we lay down our call-outs. Dedicated to the temple that is this land and church, we celebrate the rites of fertility and abundance. Our rich spiritual tradition is possible through ancestor connection, the circles upon circles of heart circles, and through a commitment to SUBJECT – SUBJECT consciousness. This is the container we create to be weird and queer to celebrate our unique fertility rites. We call all of our Rad Fae Family, ye varied and many creatures bound by a shared and sacred Past to a shared and sacred Future, inviting us together in the Queer Present to Remember who we were, are and becoming. We reach back to remember where we came from and who we so that we may to move forward from the heart; we root to bloom. As we call back to the roots of our tradition, we release the misguided idea that this is a psychedelic free-for-all in the woods. Please protect our rituals and bring your friends who want to respectfully participate and take responsibility for orienting them to this temple in a good way. Send random ravers elsewhere. Registration to participate in this Radical Faerie Beltaine is a MUST. Speaking of roots and blooms, our focalized reach-around is the garden. We are calling garden faeries to work week to get the garden set up in a way that faeries can plug in throughout the week. Yes to Radical Faerie food sovereignty! We are only a few hundred dollars short of having raised enough money for a new, high-quality greenhouse skin. Come home to sing, to dance, to “take your fill of love” in that place where processing ends and ritual begins. Great Circle is more than just a meeting. It’s a gatherette for Radical Faeries who love this community and want to help it evolve and thrive. It is an intense and magical co-created process with the power to transform our community and our relationships. We commit as active members of Nomenus to subject-SUBJECT consciousness in all our interactions. We aim to co-create interlocking consensus-based working circles, tightly bonded with love and trust, and surrounded and supported by a larger community. 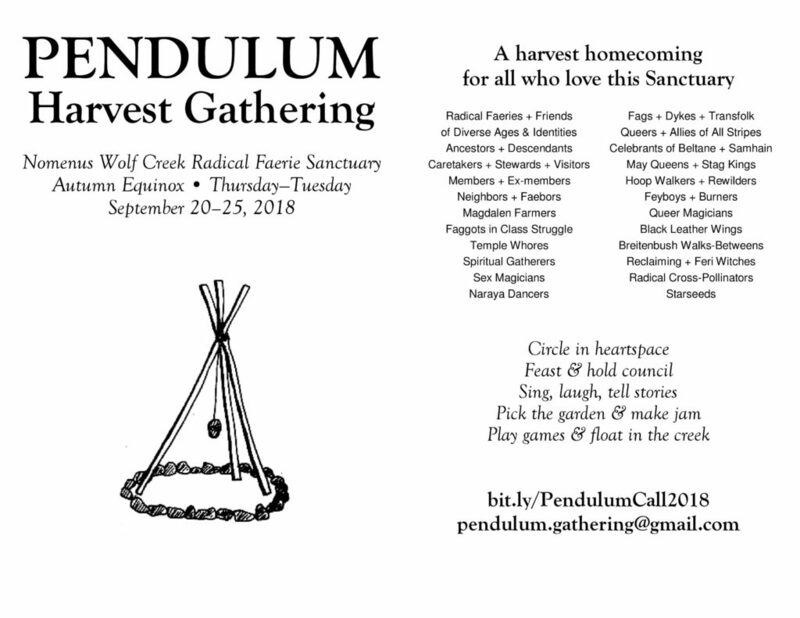 Great Circle is a container for us to clarify and come to agreement about sustainable, consensual relationships between the land itself, the ancestors, Nomenus, the Wolf Creek Sanctuary Land Community, other Nomenus projects, and the wider radical faerie community. We are pleased to announce that the Sanctuary is again welcoming visitors, but on a case-by-case basis with advance notice. The squatters were evicted from the nearby property in January, and have moved just across Wolf Creek Road. Wanted signs for them are posted all over town. We have not had a trespassing incident with them since Christmas Eve, though they have come partway down the driveway. Hopefully pressure from law enforcement, along with the cold, wet weather will continue keeping them away from our place. We have decided to cautiously allow visitors again, but the situation is subject to change at any time. If you wish to visit the sanctuary and offer support to the land community, PLEASE contact us at caretakers@nomenus.org in advance. We need communication prior to your arrival so we can give you the up-to-date situation on the land and ensure that there are indoor spaces and resources to welcome you. Thanks for your understanding! The Sanctuary is temporarily closed to guests except by special arrangement, due to the increased threat from hostile neighbors across the creek. We are seeking seasonedvisitors, for shorter or longer stays, who can help tend the Sanctuary and give the Caretakers time off during this challenging period. Please contact the Caretakers to discuss what’s involved. We are also looking for a volunteer (preferably local) to act as the Land Liaison: focalizing support for the land folks and communicating needs to the larger community. To contact the land community, email caretakers@nomenus.org or call 541-866-2678. For background on this situation and more ways to help, see the Call for Support. We want people to know that this is an urgent situation and the land folks really need support from the community right now. Please continue to pray and call in magic for the protection of all beings and structures on the Land, and a rapid and beneficial resolution to this stressful situation. Members and friends of Nomenus are welcome. New participants are asked to observe before participating. The Wolf Creek HOT Shower Project is coming along swimmingly! The solar heating is expanded, for a LOT more hot showers, even in the mornings and evenings! The showers have been rebuilt and we have a beautiful new deck. This year, we’re on to Phase III, and we need your $upport. We need your money to buy materials. We need to raise $3,000 by June 30, to complete Phase 3: Finish and expand the deck and sink area, add a ramp for easier access, rebuild and improve the sink area, add a new bench under the tree for changing & lounging, and some maintenance and improvement of the solar heating system. Phase 1 & 2: DONE! Finish the fabulous shower deck sink ramp bench & more. Phase Three will start at the Spiritual Gathering of Radical Faeries (July 13-23), and be completed early in the gathering. Eric Erdmann and Boondok Carl VanderZanden are doing the planning and up-front work. We will be joined by other community members at the SGRF gathering to do the construction. Eric and Boondok have been Wolf Creek faeries for more than 20 years, and bring a lot of construction experience. This is our way to offer our skills and give back to the community. Please help us with your give back of funds to manifest this dream. The cost of materials for PHASE III is $3,000. Any funds remaining will be held and used for Phase 4. Contribute via paypal directly to Nomenus.org, and tell one of us how much you sent. Need another option? Call or email either of us. The call and Registration for SGRF is out! It has been more than 30 years since our elders arrived in Oregon carrying with them hope and the tools to cultivate family and culture in the remote land. So many generations of the children – young and old – have sheltered at Wolf Creek seeking the same things, free of the repressive default world. They rushed into the loving welcome of the valley, and into the verdant comfort of the gentle yet aged grandfather maple, his arms outstretched to embrace all his beautiful sprites and satyrs. We call the sacred children of all the generations home to the hearth where we gather and embrace, love, share and commune in our fae spirit and light. We dance in the tall reeds of the clearing and sway to the drums, honoring those who have gone but who paved the way for us, and ennobling those who might carry the fire forward. To the generations who walked those miles ahead of us and those yet to make their marks, we gather to lift each other up inspired by our brotherhood and connectedness. We bind with our hands in circles. With open hearts and minds, we bare our inhibitions to the light of sun and moon to banish doubts and shadows. We combine our magic and wisdom, given without anticipation of reward, to summon the best part of ourselves and our brothers. This year’s Gathering will have a particular focus and theme, reflecting upon the past as a guide to the present and a springboard to the future, a unity of time and motion. We hope to offer opportunity for self-reflection as well as group engagement on where we’ve been and where we’re going, individually and as a community. We encourage all who attend to think about these issues ahead of time, and to come to the Land with an idea or issue – about themselves or this community – they wish to explore over the course of the week. The Spiritual Gathering of Radical Faeries, or as it has become known, the “Mens Gathering,” is a “specific container event” for those persons who self-identify as male and whose sexual orientation is male-centered. This includes a large number of folk who have intersectional identities, including trans men, faeries, faggots, queers, homos, gay men, and many others. While we rejoice in and celebrate all identities, the purpose of *this* Gathering is not necessarily to explore various intersectional identities but to keep the focus on male-to-male interaction and relationships, however the *participants* construe that. We acknowledge that this container may not feel appropriate for all who might wish to attend, and we lovingly encourage them to explore other events at the Sanctuary. Come and join together as we laugh, play, sing, dance, cry, sigh, howl, chant, love and cherish one another for a week of magik and communion. TAINT gathering now has a crowdfunding page!